This week's going to be misleading ad week. To kick it off I'm bringing you a new advertising campaign from Canadian supermarket chain Sobey's. Whether it was intentional or not I don't know (it may simply reflect ignorance), but at least superficially it appears as if they're trying to leverage consumer trust in Health Check, combined with unsubstantiated health claims, into sales (click the picture above to see the campaign). I found the campaign to be so misleading that I've written a letter that I've sent this morning to Ms. Belinda Young, Sobey's Executive Vice President of corporate brands. I also copied the letter to the Canadian Competition Bureau. My name is Yoni Freedhoff and I’m a physician in Ottawa whose practice focuses exclusively on nutrition and weight management. 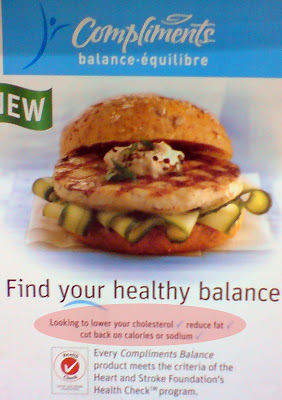 While shopping at one of my local Sobey’s the other day I was appalled to see what I felt was an incredibly misleading marketing of your partnership with Health Check (photo attached). Putting aside my well-known condemnation of what I feel to be the Heart and Stroke Foundation’s grossly underpowered, nutritionally short-sighted, misleading front-of-package Health Check program, they themselves state that, “Health Check is not a weight loss or calorie restriction program”. The program does not in fact possess any criterion that limits calories in Health Check items. Regarding calories and your Compliments Balance products, I’m sure your customers would be surprised to learn that despite Health Check having no formal criteria for calories, Sobey’s is comfortable suggesting these products will help, “cut back on calories”. They would surely be surprised to learn that items such as your Compliments Balance Original Granola cereal in fact contain bowl for bowl almost double the calories of most breakfast cereals including such sugary nutritional voids as Cocoa Puffs, Cap’n Crunch and Frosted Flakes. have all signed off on Canada’s National Sodium Policy Statement that recommends Canadians target 1500mg as their daily sodium maximum. Yet for reasons inexplicable to most health care professionals Health Check has not adopted those more stringent recommendations. What this means of course is that Health Check options such as your Compliments Balance Penne Bolognese with 900mg of sodium in fact contain more than 60% of the total daily recommended value endorsed by virtually every credible medical organization in Canada – an amount far higher than someone trying to “cut back on their sodium” should consume in one serving. Regarding cholesterol – I fail to see how eating Health Check products or Compliments Balance products will lower one’s cholesterol. Health Check’s meagre nutritional criteria do not directly address cholesterol. There are no requirements that items awarded Health Checks are lower in contained cholesterol, nor are there requirements that Health Check items include ingredients that have in fact been shown to lower cholesterol. Certainly there are no published studies that would suggest that eating Health Check items or Compliments Balance items such as Compliments Balance Fudge Brownie Frozen Yogurt or Compliments Balance Lean Italian Meatballs will help “lower your cholesterol”. Diet and weight related diseases in Canada have been estimated to kill 25,000 Canadians a year and obesity and nutrition are certainly among the most reported non-political topics in our media today. Consequently, improving weight and eating healthier are desires shared by many Canadians. Given the pace of our modern lifestyles and the average individual’s confusion surrounding nutrition, it’s quite disheartening to see claims in your advertisements that simply aren’t true – claims that could lead individuals with heart disease to consume far more sodium than their conditions would allow potentially endangering their health; claims that may lead people to believe that so long as they choose Compliments Balance products they’ll lower their cholesterol; and claims that suggest by choosing Compliments Balance products people will lose weight or maintain a healthy weight..
My blog, Weighty Matters, is read coast-to-coast and has had over 80,000 visitors this year. It is read by a large number of Canadian dietitians, physicians and other allied health professionals directly involved in the provision of one-on-one nutritional counseling as well as public health professionals involved in Canadian nutrition policy that I am sure will be curious as to your explanation for these misleading advertisements. Our alarm is that these advertisements clearly misinform your more vulnerable and impressionable customers – those concerned about their weights and their health. I will be posting this letter on my blog and as well as sending a copy to the competition bureau. In the spirit of open communication and fairness, I will also post your reply on Weighty Matters.